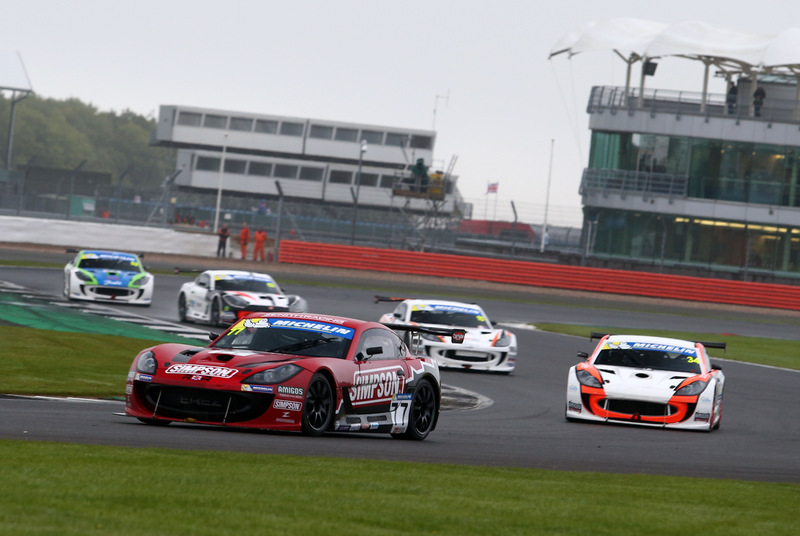 Ginetta GT4 Supercup contender George Gamble will head to the final round of the series with one eye on the title, after an impressive result at Silverstone last weekend (16/17 September). The Amigos Tequila Beer supported ace took his Ginetta to two podium results from three races, with the Northampton driver netting his third win of the season in the final race. His strong result means he now has an outside chance of the title as the series heads to a climax at Brands Hatch in October. Teammate Seb Perez would have a contrasting weekend and would find it hard to get the measure of the Ginetta in the slippery conditions at the Silverstone circuit. He would leave the Northants track without breaking into the top ten during the three races on Saturday and Sunday. A wet qualifying session on Saturday would mean choosing the prime time to head onto the circuit would be more important than ever. But both Gamble and Perez missed the optimum slot by a few minutes, meaning Gamble would start with opening race later in the day down in sixth and Perez in tenth. Despite the best efforts of Gamble, the Ginetta pilot could not make inroads on his position and the appearance of rain during the mid-point of the race meant that getting to the end would become the first priority thanks to starting the race on slick tyres. He would cross the line exactly where he started in sixth. Race two was due to go ahead late on Saturday afternoon but the earlier rain became a monsoon and with previous races delayed, the GT4 Supercup would now kick off Sunday’s proceedings. Despite a damp circuit, Gamble caught the field napping, becoming the star of the show and taking third with a quarter distance down. Even two appearances of the safety car couldn’t stunt his progression and whilst the leaders tussled, he made a measured lunge up the inside to take the lead with just a few minutes remaining. On the closing laps, he would have to give up his prime position as the tyres began to fade, but second place was impressive nonetheless. The final race of the weekend would mark Gambles first victory since the opening race of the season at Brands Hatch in April. Another storming lunge down the inside of the leading duo which saw Gamble take command of the race from the fifth lap. He took the chequered flag with a comfortable two-second gap to round off his weekend perfectly. Seb Perez would not be as fortunate as Gamble during the weekend. Like his teammate, Perez struggled during the opening race of the weekend and would not quite get to grips with the Ginetta as the rain came late on. Twelfth spot would be a disappointment to the Chesterfield ace.With the postponement of race two, Perez made the choice to use slicks for the drying track on Sunday morning. It would be an all or nothing approach, which would sadly not work out the way he wanted and headed backwards to 16th at the flag. Despite being much drier, race three offered little chance for Perez to make any gains on his starting position and rounded off the weekend with 12th. “It has just been one of those weekends again really, I just couldn’t make the car work the way I wanted it to,” said Perez. The Ginetta GT4 Supercup will now head to the final three rounds of the series at Brands Hatch in the first weekend of October.